The MOTEMS audit manual provides a structured template for methodically documenting a marine oil terminal's characteristics and assessing compliance during MOTEMS audits. The Manual is a compilation of 11 Checklists, one for each substantive Division/Section (except Section 3112F. Requirements Specific to Marine Terminals that Transfer LNG) of MOTEMS. While not required for MOTEMS compliance purposes, these checklists have proven to be useful tools for compliance assessment and communications between terminal owners and operators, MOTEMS audit teams, and the Commission. 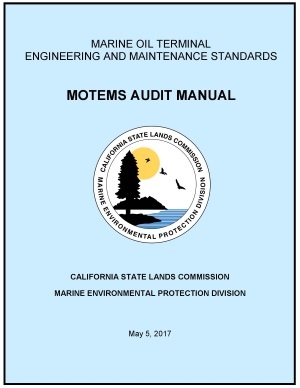 The Draft MOTEMS Audit Manual templates (revised May 5, 2017) are available in Microsoft Word format upon request.